Hanorah serenaded the crowd at Honey Martin’s on Saturday, Feb. 22. Photo Savannah Stewart. 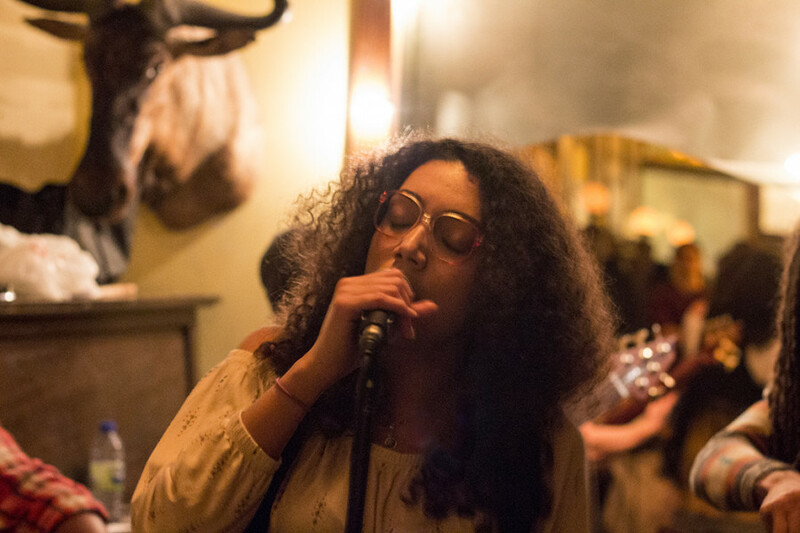 As Hanorah and her band got ready to play a set for their recently-secured residency last Saturday night, people from all over the city flooded into NDG bar Honey Martin’s cozy embrace. While the Montreal-based band played a mix of original music and covers from artists such as Amy Winehouse and The White Stripes, Hanorah’s set wasn’t just a cheerful collection of good music, it was a powerful display of emotion and empathy for issues that exist beyond the bar. Hanorah’s studio tracks are a chill mix of soul and R&B, but her live performances are anything but mellow. While the singer belted out impressive melodies, dancing and shaking her curls to the upbeat music of the four-piece band, Honey Martin was in full-blown party mode. After Hanorah started writing and singing in 2015, she sought people to play with. She met guitarist Paul De Rita while he was busking in a metro station. Soon after, keyboardist Christian Henegan-Comeau and bassist Adam Shore came on board. At the time, the two were also playing together in another band called Safe and Sound. Their familiarity with each other’s style really added to the harmony of the band, Hanorah said. Olivier Cousineau, their drummer, was last to join the project, but De Rita said that he was worth the wait. The band’s lively accompaniment successfully showcases Hanorah’s powerful, smooth-as-silk singing voice. But more than that, her band is part of the support system she relies on as she confronts the trauma of her sexual assault. De Rita often contributes to the song writing, but he makes it clear that the lyrics are Hanorah’s space to express her thoughts and feelings. Her upcoming EP, Post Romantic Stress Disorder, deals with the aftermath of assault. The track “Clementine,” with the lyric “Was it my fault?” woven repetitively through the chorus, highlights the difficulty survivors of sexual violence often face when coming to terms with their experiences. But it wasn’t always so easy to be open about her experience, Hanorah said. In her 2015 debut album, Unstuck, Hanorah admitted that being direct about its subject matter was challenging. However, listeners responded with encouragement and gave her the confidence to address the topic of sexual violence more openly, she said. She hopes her music can help survivors of sexual violence realize that others have been through the same difficult experiences. With a solid support system behind her, Hanorah feels that she has a responsibility to do this work. Though she said it happens more online than at shows, Hanorah has had several survivors of sexual violence share with her the impact her music has had on them. “I’ve been approached by people all over the world. […] That’s what’s great about the Internet— you can really reach people.” And she says what matters most to her is connecting. Hanorah and the band are finishing up with a third album and they just came back from a mini-tour in Toronto, which De Rita said has only made the band tighter. That, along with their weekly shows at Honey Martin, points to an exciting future for Hanorah and the band.